Three months after the attacks of September 11, 2001, Congress officially charged the Smithsonian and the National Museum of American History with collecting and preserving artifacts that would tell the story of that day. But where to start? If you were given the task, what objects would you collect? 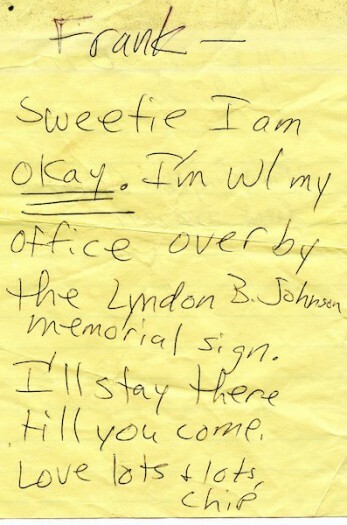 Note from Pentagon Worker, September 11, 2001. Curators working at the attack sites were grappling with those questions. If they tried to collect the whole story, they would have quickly been overwhelmed. Instead they identified three points of focus to guide them: the attacks themselves, first responders, and the recovery efforts. Fifteen years later, the collection includes more than a thousand photographs and hundreds of objects, among them memorials, thank you letters, pieces of the Pentagon, first responder uniforms from the World Trade Center, personal items such as wallets and clothing, Emergency Medical Technician equipment, parts of fire trucks, and portions of the plane from United Flight 93 recovered from Shanksville, Pennsylvania. 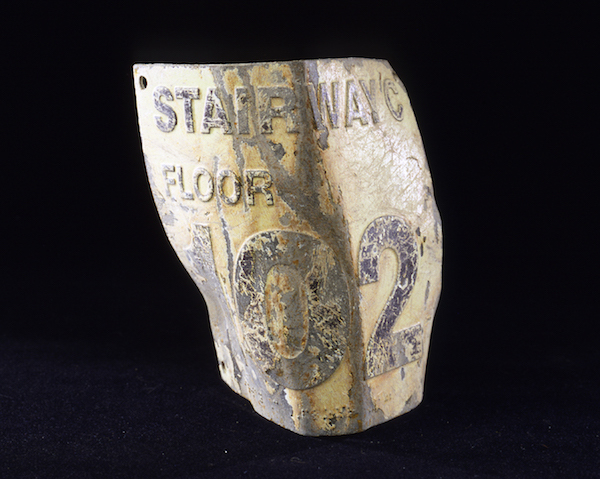 The objects in the museum’s September 11 collection show both the ordinary and extraordinary moments in the midst of the devastation, reminding us of the chaos, the bravery, the loss, and the unity that we all felt that horrifying day. We see it in the handwritten note from Daria to Frank Galliard. Both worked at the Pentagon, and in the chaos after the attack, not knowing one another’s whereabouts or conditions, they each separately made their way to a prearranged emergency meeting spot. Daria arrived first and scrawled a note in black pen on a scrap of yellow paper: “Sweetie I am okay,” with the “okay” underlined three times. 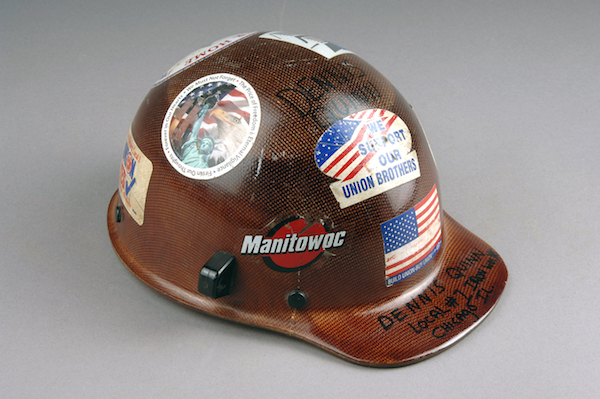 September 11, 2001 Iron Worker Clean-Up Crew Hard Hat, World Trade Center. We see it in the hard hat of Dennis Quinn, an ironworker from Chicago who journeyed to New York to help clear debris. The skullguard-style helmet is practical—it’s designed to withstand high temperatures and is equipped with welder’s lugs. But it’s also personal—the owner’s name and union affiliation are carefully written in permanent black marker, surrounded by union and 9/11 stickers bearing the American flag, a bald eagle, and the statue of liberty. And we can see it in the twisted metal and scratched stripes of blue, pink, and orange in the fuselage of Flight 93, whose passengers and crew lost their lives fighting to ensure that no more buildings would be hit. 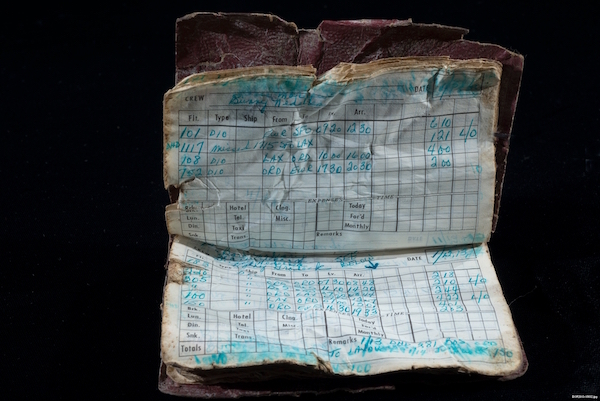 Flight Attendant Log Book, Flight 93, Shanksville, Pennsylvania, September 11, 2001. To commemorate September 11, the National Museum of American History is offering visitors the opportunity to interact and respond directly to select objects from our collections. The artifacts will be presented in an unmediated physical display, with no glass or casework between the visitors and the collection. We invite visitors to share their memories and thoughts, either in conversations with staff and other visitors, or by sharing through our Talkback boards, which provide the opportunity for written comments. As historians, we continue to ask ourselves: How will Americans remember these events 25, 50, or 100 years from now? What questions will future generations ask? We can’t know for sure, but we do know that places like the National Museum of American History enable us to reflect on what it means to be a part of history, to contemplate how historic events affect our lives as individuals and as a nation. World Trade Center Stairwell Sign, September 11, 2001.
is Deputy Chair of the Division of Armed Forces History at the National Museum of American History. Primary Editor: Sara Catania. Secondary Editor: Callie Enlow. *Photos courtesy of National Museum of American History, Smithsonian Institution. Lead image: Fuselage from Flight 93, Shanksville, Pennsylvania, September 11, 2001.